Muddy Loafers: MIRIAM MAKEBA – THE SINGING MAMA AFRICA. 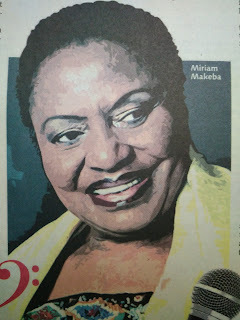 MIRIAM MAKEBA – THE SINGING MAMA AFRICA. but was also a spiritual healer. When her mother was imprisoned for brewing illicit beer, Miriam as a child of 18 months was taken along and spent six months in jail. After her father’s death, Miriam lived with her grandmother in Pretoria, where she was encouraged to sing in church. In 1947, at the age of fourteen, Miriam gave her first solo in church during a Royal visit. Miriam lived up to her middle name ‘Zenzi’ (meaning you have no one to blame but yourself) by taking charge of her destiny early in life. She soon realized that her voice was her ticket to freedom. But she was also aware that as long as there was Apartheid in South Africa, there was no hope of a career in music. Africans were known for their musical creativity and improvisation skills in rhythm, tonal qualities and verbal content. African jazz and ragtime was combined with Anglican Church music to form a distinct vocal style called Mbube. For a while Miriam sang with the Cuban Brothers. She was also a member of the all female group called the Skylarks. In 1954, she joined a pop band called Manhattan Brothers. This advanced her singing skills. She had a wide voice range and her songs were poignant with emotion and touched the hearts of her audience. With Manhattan Brothers she toured Rhodesia (Zimbabwe) and Congo. In 1957, the band toured the rest of Africa for 18 months, with Miriam as its soloist of African Jazz and traditional African music. In a movie King Kong the story of a South African boxer, she was given the female lead. International recognition came to her through her singing part in “Come Back Africa” a documentary of Black life in Africa. The Director Lionel Rosogin a white man invited her for its screening at the Venice Film Festival in 1959, which made her an instant celebrity. Miriam was one of the first African musicians to bring African music to western audiences. Some of her songs were critical of Apartheid. Nelson Mandela said, “Her music inspired a powerful sense of hope in all of us.” In 1962, she testified at the UN Committee against Apartheid and asked for economic sanctions and arms embargo against the government in South Africa. Over the years, Miriam became identified with Black Consciousness. She was acutely antagonistic to Apartheid and the white minority government in South Africa. She became a vociferous activist and a champion of Black power. She took part in fund raising for these groups and held a benefit concert in aid of Martin Luther King Jr’s Southern Christian Leadership Conference. Emperor Haile Salassie of Ethiopia invited her to sing at the inauguration of the Organization of African Unity. For her anti-apartheid activities Miriam was banned from entering South Africa for 30 years. She could not even attend the funeral of her mother who died during the Sharpeville Massacre. However, she became an honorary citizen of 10 countries. In her autobiography published in 1988, she wrote about the demeaning aspects of Apartheid. Miriam was able to enter South Africa only after the end of Apartheid, when she sang at the function felicitating Nelson Mandela after his release. Miriam’s personal life was something of a tragedy. She gave birth to a girl called Bonzi at the age of 17. Soon after, she was diagnosed with Breast Cancer. She claimed that she was healed by her mother’s herbal and spiritual administration. A decade later, she developed cervical cancer and had to undergo surgery. Rather unconventional in her life style, she had five husbands at different periods of her life. Miriam’s best known songs are ‘Malaika’, ‘Pati Pati’ and the Click Song and are sung even today. Her output consisted of 30 original albums and 19 compilation albums. Miriam died at the age of 76 in Naples, on November 9th, 2008. This singing ‘Mama Africa’ as she was popularly known, had sung for thirty minutes at a concert in aid of a movement against organized crime, when she suffered a massive heart attack.